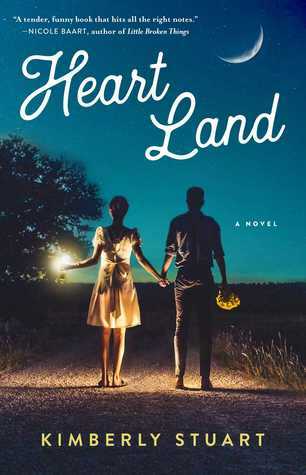 Goodreads description--A story of reconnection, lost love, and the power of faith, Heart Land follows a struggling fashion designer back to her small Iowa hometown as she tries to follow her dreams of success and finding true love. Heart Land's description was accurate and misleading all at the same time. I won't go into details on what was misleading because that will probably be too much information/spoilers. But I will say that I hate when this happens--when I read a book and realize the description wasn't entirely accurate. Just tell me the truth without trying to doctor it up. If there are details you don't want to put into the description then leave them out entirely without misleading me. Grace has been living in New York and working at Milano for 6 years I believe. That's a long time to be doing a job without promoting even if one has been all but promised to you. And it is kind of a long time to be stuck in the denial stages about certain events of your past. Grace wasn't always the easiest character for me to read. I didn't relate to her in many areas. I've never been hugely fashionable. I don't fault those who are, but that's not me. I wear what I like and what I feel good in, but I'm never going to pay $700 on a handbag or a pair of shoes. I'm way too practical for that. I don't care how good they look, how nicely crafted, or what designer dreamed them up. And the issue that I usually take with fashionistas is their tendency to judge others for not being up to their standards. As an adult (no longer in high school), I am so far beyond caring about the clothes that others are wearing or what they think about the clothes that I wear. When you're in high school there's so much conformity and it is so important (or at least you think so) to wear the "in" thing, but after that you're thrown into a melting pot of people with completely different tastes. And everyone likes different styles and we're all okay with that. Until you stumble upon someone so absorbed with fashion that they feel the need to judge and look down upon what everyone else is wearing. It annoys me. So this part of Grace's character annoyed me as well. Another way that I don't relate is that I don't like the city. I grew up in a small town. But it isn't just that, so many people in such a small space drives me nuts. I even dislike traveling to major touristy places because I dread being surrounded by so many people. Grace's love for New York wasn't something that I understood or something I could commiserate with her. But her biggest reasons for wanting to be in New York were more about running away rather than running to anything. I hated her boss even early on. I liked Tucker, but I felt like too much of the blame for their relationship issues both now and in the past were placed on Grace. He could have made some different decisions then and now. I loved Gigi with everything in me. And most of the characters of Grace's hometown. However, I felt like Grace was really gullible and the conflict could have been seen from outerspace. I wish there would have been more action on her part to salvage things when they went bad there at the end, but legally I guess I understand that probably nothing could have been done. Some of how things wrapped up was just a little too easy for story purposes and not entirely believable to me. I was completely and utterly surprised to find a spiritual message in this book as it wasn't marked as Christian nor was that in the description. But I was beyond happy to see it included. The entire book wasn't about this message so you could still enjoy the book even if that's not your thing. There's something so appealing to me about a story with a moral that isn't preached at you. However, I did find Grace's lessons a little easily learned in the telling of them rather than showing her faith journey. Heart Land was a fun and quick read for me, but it wasn't without flaws. I found the description misleading. I didn't connect to the main character as much as I would have liked. But I can't say that I was surprised given the fashion stuff was a major part of the description. I enjoyed the Christian aspects thrown in. And I loved Tucker's generosity and personality even if I wish he'd done a bit more to step up when the conflict arose. All in, Heart Land gets 3.5 Stars. Have you read Heart Land? What did you think? Let me know! I have had that happen a couple of times and it upsets me too. I don't like to be mislead. Either their book stands or falls and I don't like to feel tricked. Great review regardless. Exactly. No need for all of that. Especially when you read the book and see how minor the changes were that they made. It's like "why bother?" Thanks for commenting Sherry!